The plan I had for tonight was chicken quesadillas and a new Netflix movie while snuggled on the couch with Sean Michael. I am sitting here 0 for 2. Besides trying to help our community purchase much needed wood for the Waldo County Woodshed with an auction tonight on our Facebook page and painting some new jewelry pieces, we are caring for a couple goat kids in my kitchen. Just a typical Friday night. Sean just called the house phone from the barn for help because two of our young buck kids were down and not getting up to eat. Goats never miss a meal. When they do- something is VERY wrong! Worm load? Injury? Bullying? Lack of food/water? Cold? Disease? Something else? Every possibility ran through my head one by one, and I ruled out those that were not likely as I grabbed my coat and shoes. We've been checking for worms. Not that. They have plenty of food and water available. Disease? Injury? Hard to see in the dim barn light as one by one, Sean handed kids to me over the stall wall. We got them inside where we could take a good inventory of matters. Eyes clear and alert. No elevated temperature or cough, no discharge or blood, and no scouring evidence. A little on the thin side despite ample food and water. And, icy cold. I was quickly narrowing down my suspicion. It starts with serial nights of temperatures in the negative double digits. Compound that with snow storm after snow storm coming through, winds howling and dropping over 3 feet of snow on us in just over a week, making opening the barn doors to let the goats out to stretch their legs ill advised. We have 4-5 goats in each 10' x 10' stall. This is sufficient in conjunction with pasturage. When freak weeks like this happen, it can mean bullying. In this case, it seems Keren and Naomi have been beating up on the boys. Eli is fine, fat and happy. Ethan and Judah, our mild-tempered lads, are at the low end of the totem. They are last in line to get food- even when offered at multiple stations. Digesting food provides some body heat as well as fat stores as protection in the frigid cold. Though they have food available and were eating something. It was not enough in this kind of prolonged severe weather. Up and eating yesterday, down and in serious jeopardy tonight. If Sean had not caught this while doing chores, I believe we would have found two dead bucks in the morning. Judah is leaning on the bureau, scratching his back. Ethan's tucked posture is a concern. Judah is carrying his posture well; legs and back straight and normal, tail loose and free to waggle. He was as cold to the touch as Ethan, but clearly, he was the better off of the two. Notice the difference in posture; Ethan's tail tucked up under his stomach, back legs bent and back tucked. This lad was showing some serious signs of distress. If my suspicions were right, warming them slowly and offering food and water would show a world of good in a short span of time. If not, we'll need to look into other possibilities. About an hour later, both bucks had improved. Judah looked almost normal. Ethan was standing much better, not nearly as hunched up. Both were eating of their own volition. Both passed regular pellets. So, what to do to prevent something like this happening again? Well, it looks like there is going to be some changing roommates. Thankfully our breeding season is over and we can mix up the herd as needed until the weather changes and everyone can live where they normally do. Ethan and Judah are going to be housed with sweet Ellie, Cassie, and Jem. Asher, Jane, Jesse, Bailey and Lily will share another stall- the girls were all bred with Asher already. That leaves our younger bred does; Meme, Haddie, Keren, Naomi, and Abigail to share the third stall and unbred does; Leah, Rachel, Keziah, and buckling Eli to share the last stall. That is right, we have 8 bred does this year. That delights and terrifies me in equal measure, but that is another post entirely. For tonight, everyone is doing well. We'll set the alarm clock to check our boys when we check the wood stove. Hopefully, by morning, they will be ready to return to the barn. 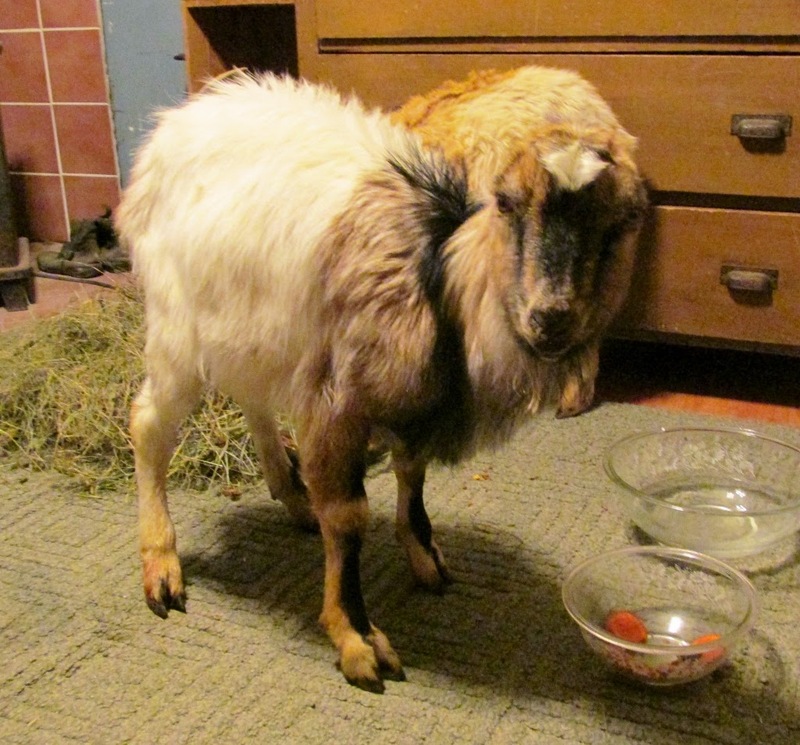 We do what is necessary to preserve life, but living with the goats on a permanent or even semi-permanent basis in the kitchen is not as fun as Molly thinks it is. No. Really. It's not. 2 kittens, 1 puppy, and 2 goat kids. I wish I had another safe place to keep them, but the dogs have taken over the upstairs laundry room. The family room is out because it is carpeted. 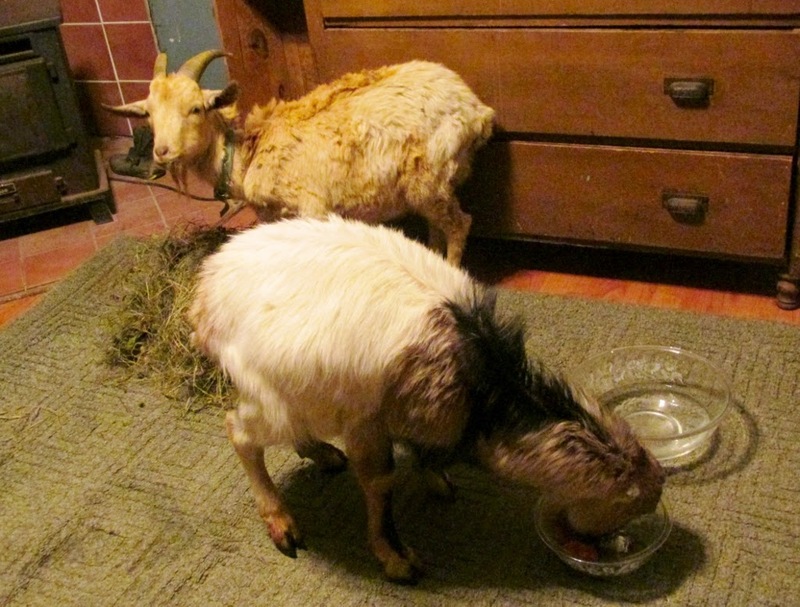 My studio has too many things for goats to ingest. The bathroom is too small and would be really, really inconvenient for human needs. Bedrooms are obviously out. In years past, in an emergency, we could use the cement floored basement, but that is now Caitlin's apartment. So, there it is. as she was in the new arrivals. To keep things as sanitary as possible, I put down an old, unused area carpet that will be disposed of. This helps the goats with traction and encourages them to remain on it. They do not care for slipping on wood floors. Obviously, we clean up after any messes immediately. Once the boys are completely out of the woods and return to the barn, we'll sanitize everything in the vicinity thoroughly. This morning, Judah is back to his normal self. 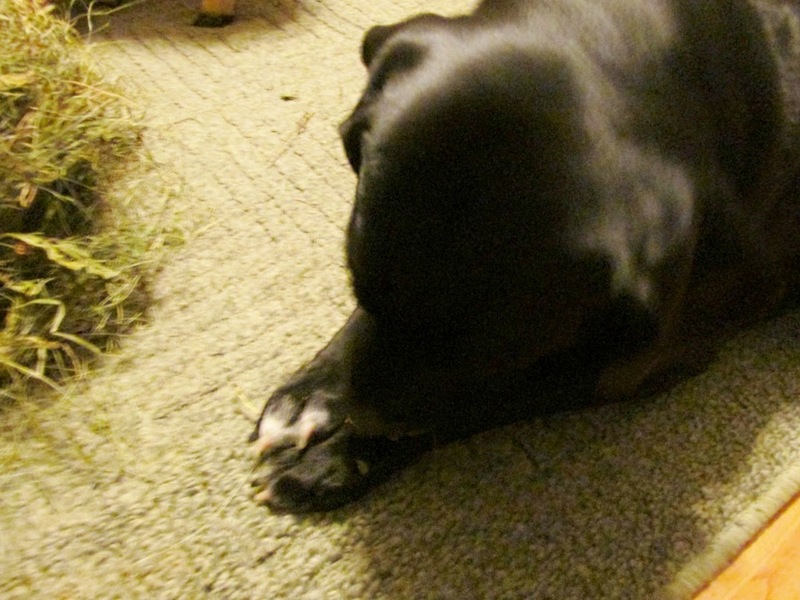 The little goober passed the night standing next to the wood stove fan, alternately warming his horns and his sides. I worried, with the wood stove obviously being hot, that he could suffer a burn to himself. But, he is smarter than I gave him credit for and manages to stand close enough to the blowing air to get warmed without leaning on the stove itself. It probably also helps that covered in dense fur, there is a barrier between the hot stove and bare goat skin. Still, it bears constant watchfulness on our part. Much better stance. Still not 100% but, what a difference! of his urine and the tightness of his skin, he is still somewhat dehydrated. I was happy to see him take several long drinks this morning while I cleaned up the mess from over night and Sean washed and dried Ethan's underside area. And, I would like to see him act more interested in his surroundings. It is still early yet and perhaps that accounts some for his quiet behavior. He is standing much better, at least, no longer hunched up. He is not eating with an appetite, but he is picking at this morning's fresh hay, He gave this morning's grain offering a pass. A new concern is what seems to be some nasal discharge and his breathing sounds like he has some congestion building now. Cold? Pneumonia? Something is off. Sean called our vet. 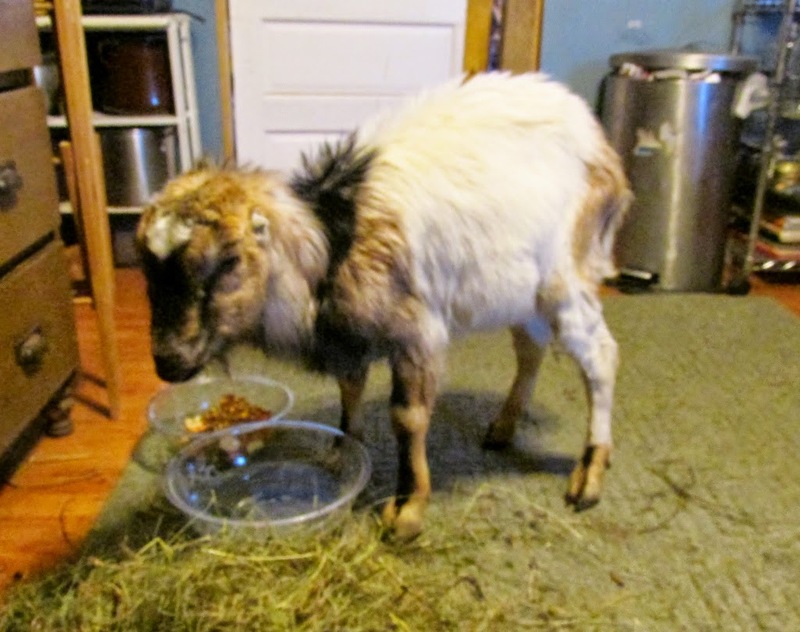 We now suspect that Ethan has pneumonia which is somewhat common in goats. We'll administer an antibiotic and some pain medication and go from there. Sean is going out to the barn for morning chores and after breakfast, will be working on moving goats to their new stalls and widening the paths to coop and barn in preparation for the 3"-6" or 6"-12" snow fall anticipated over night. We are on the line and could get either. How insane is that? We're in for snow. It could be 3" or maybe we'll get 12". Meanwhile we are counting down the days until spring. This has been a rough winter for us all. Thanks for stopping in for a visit today, friends. It is nice to have some company. So happy Sean found them and you are caring for them on the inside. I know it is not ideal, but shows how much you truly love your critters!!! I hope the goats continue on the upswing. 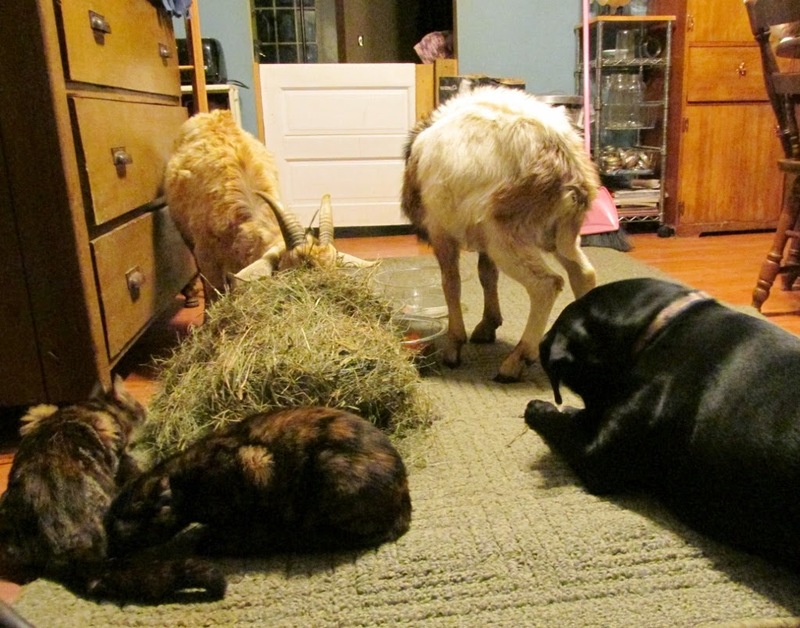 This extreme cold must be stressful on the barn animals.